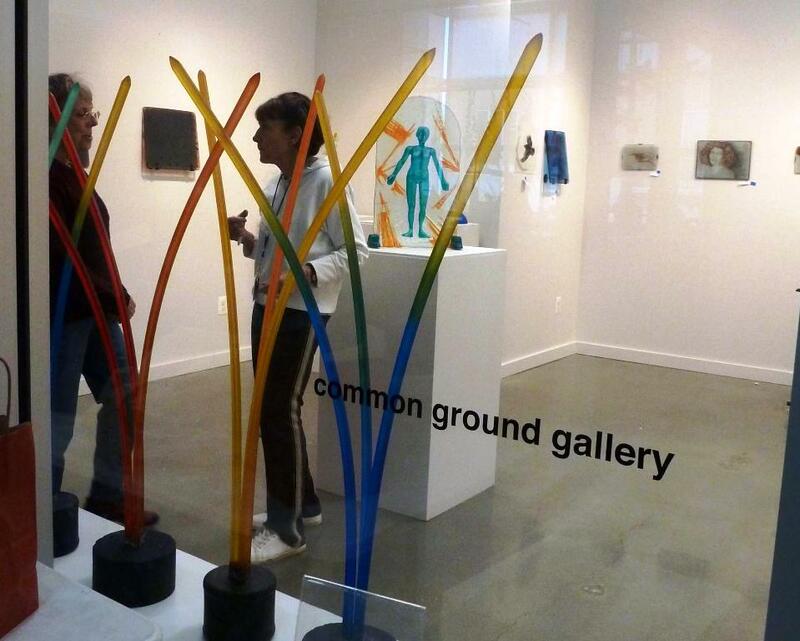 Glass artist Nancy Donnelly has a solo show of her latest glass artwork on exhibit at VisArt’s “Common Ground Gallery” in Rockville, MD. (Through March 24, 2013). Nancy’s kiln-shaped glass sculpture and wall reliefs reference natural forms in glass, glass enamel, steel, concrete and transparent color. The Washington Post newspaper has a review of her show in today’s (Friday 15 March) paper – what a great review! Excerpt below is from WaPo art critic Mark Jenkins’ article. D.C. artist Nancy Donnelly does landscapes, still lifes and figure studies, all traditional genres. But hers have an added aspect, because they’re translucent. Six years ago, Donnelly began working in glass, which makes even the thinnest of her works sculptural. “Transmission,” her show at VisArts at Rockville’s Common Ground Gallery, encompasses rectangular compositions with just a hint of depth, pieces in which certain elements protrude from the plane and works that are fully three-dimensional. The last category includes flower arrangements such as “Bouquets,” whose simplified forms suggest pop art’s directness but whose colors subtly shift along the length of the glass fronds. Among the near-flat objects are nature scenes such as “Sea and Sky I” and the more abstract “Tribute to William Morris,” a homage to the Victorian-era designer and theorist that employs a subtle black and green palette. Perhaps the most striking sculptures are those in which well-rounded female nudes, rendered in bluish or greenish glass, emerge from contrastingly hued blocks. They’re metaphors for creation and liberation, making them pertinent not just to one artist who has found her medium. Look at the Post online – click HERE. This entry was posted in common ground gallery, Nancy Donnelly, Transmission, VisArts, washington post by Chip Montague. Bookmark the permalink.